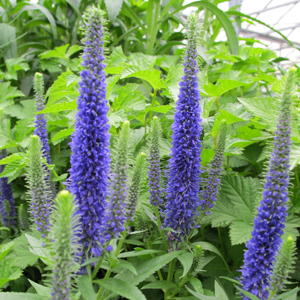 (Spike Speedwell) Veronica ‘Royal Candles’ PP18,932 has abundant violet-blue flower spikes which resemble candles. These dark blue candles stay lit all summer long!!! The compact deep green foliage of ‘Royal Candles‘ PP18,932 does not die out like other Veronicas. An excellent perennial that is a must have for every garden! It also attracts butterflies.